Her aunt lived in New York in the 1920s & 30s. As a young woman, she was a fashion buyer of sorts. 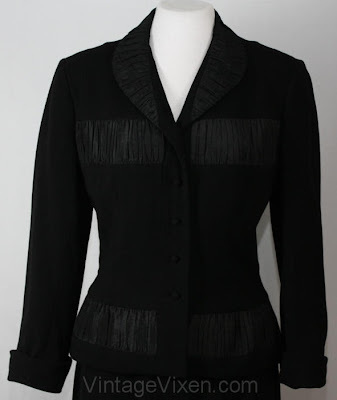 Her crafty mission was to shop Bergdorf Goodman for the very best designs, purchase one of each, and take them back to the sewing department where she worked at a lesser-priced department store. Then the seamstresses would copy each gown, line for line, and make up copies of the designers' originals. 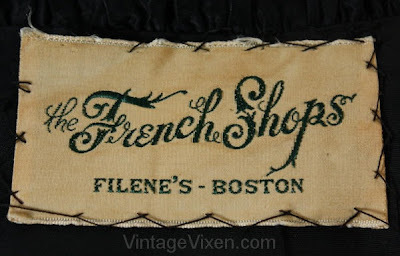 Its label is clearly inspired by Paris, yet just below "The French Shops" it tells us a much more mundane origin - Filene's Department Store in Boston. Yet the look is exquisitely Parisian, wonderfully executed. Back in the 40s we could wish for a French name to the point of emulation like this, even if we Americans couldn't technically create it or afford it. was more blatant before branding and licensing grew in importance. Even Hollywood starlets were hard pressed to purchase French originals. Marsha Hunt, an ingenue signed by Paramount at the tender age of 17, had the difficult task of existing in the limelight with a limited budget for her personal wardrobe. It was 1934, and the cameras were focused on her. She writes "the choice arose: whether to splurge on a very few fine originals, or for the same money to buy a much greater variety of less expensive things". Marsha Hunt in 1937, wearing a pretty frock probably from her own wardrobe - and probably a copy! Of course our friend from Long Island could've copied all the "fine originals" and made a wardrobe for Ms. Hunt for much less. And this is indeed the direction Marsha went. She shopped "often and carefully" at department stores and smaller shops, always seeking and finding more than she could afford. Indirectly, the couturiers must have been dismayed at such activity. But at least, thanks to the copyists, there was even the possibility!